Audio. Srila Bhakti Vinod Thakur's Appearance Day, 1981. Srila Bhakti Raksak Sridhar Dev-Goswami Maharaj tells us how Srila Bhakti Siddhanta Saraswati Thakur by the order of Srila Bhakti Vinod Thakur took Gaura Kishor Das Babaji as Gurudev formally, but knowing Bhakti Vinod Thakur was his real guru from the internal consideration. He was filled with Bhakti Vinod Thakur in the spiritual sense. He installed many Maths where the name of the Deities were Vinod Vilas, Vinod Ram, Vinod Ananda, etc. He knew that his attempt to approach Radha Govinda and Mahaprabhu was inconceivable without Srila Bhakti Vinod Thakur's intervention. He saw Radharani and Gadadhar in Srila Bhakti Vinod Thakur - the highest ideal of Guru Tattva, in Gaura lila, Gadadhar; and in Krishna lila, Radharani. He also told once that if we rise a little higher and look, we shall find Radharani in Gurudev. The source of the grace of the guru is coming from the original source of service, so he used to see Srila Bhakti Vinod Thakur under that light. 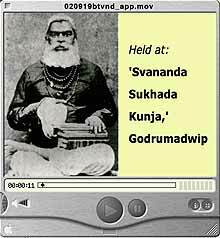 Audio: Appearance of Srila Sachchidananda Bhaktivinod Thakur. 6 September 2006 morning informal discourse by Srila Bhakti Sundar Govinda Dev-Goswami Maharaj at our Dum Dum Park Temple, Kolkata. "Srila Guru Maharaj... mentions...: 'Not only is he (Srila Bhaktivinod Thakur) the giver of service to Vrindavan Dham, he can give service to Radharani.'" higher quality (7.8 MB mp3 audio). Audio: Srila Govinda Maharaj speaking on 26 September 2004 from our Soquel, California, Sri Chaitanya Saraswat Seva Ashram by phone for the Internet broadcasts hosted by Madhusudan Prabhu of Hawaii. Download or listen online (23 mins, 2.7 MB mp3 audio). 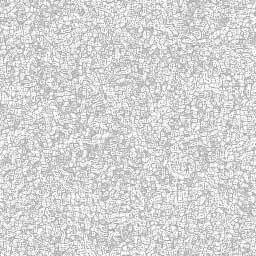 Audio (in Bengali). In praise of Srila Bhaktivinod Thakur: a sloka by Srila Bhakti Raksak Sridhar Dev-Goswami Maharaj, and a paragraph by Srila Bhakti Siddhanta Saraswati Thakur, both read by Sripad B.P. Tirtha Maharaj from the Bengali Sri Gaudiya Darshan magazines of 1955. The Bhagavata - Its Philosophy, Its Ethics and Its Theology as edited and published by Sripad B.S. Goswami Maharaj in 1985 in a truly beautiful format. 35 pages in full colour: 23.8 megabytes pdf file. Sri Dasa-Mula: The Ten Fundamental Divine Principles as translated and published by Sripad Swarupananda Prabhu in 1990. 15 pages, 0.5 megabytes pdf file. Slides with audio: Srila Sachchidananda Bhaktivinoda Thakur's 165th Appearance Day Festival held at his Bhajan Kutir across the River Ganges in Godrumadwip. A large contingent from our Temple join a grand parikrama and assembly of Vaishnavas to honour this occasion.